Situated beside the Seine, and separating the beginning of the Champs-Élysées from the Tuileries Gardens, lays the Place de la Concorde (Square of Harmony); the largest square in Paris. and originally constructed to hold an equestrian statue of Louis XV that the city of Paris commissioned in 1748. Construction began in 1754 and was completed in 1763. Initially, it was called Place Louis XV. Place de la Concorde is often linked with some of the dark, and often bloody, events that took place on its pavement. In 1770, 133 spectators were trampled to death at a huge fireworks display on the occasion of Marie-Antoinette's wedding to Louis XVI. Years later, the revolutionaries, intent on eliminating all royalist monuments from the face of the earth, removed Louis XV's statue, renamed the square Place de la Revolution, and set up their guillotine on it. Among those executed were Louis XVI, Marie-Antoinette, Charlotte Corday (the murderess of Marat), Danton, Philippe Égalité, Robespierre, and 2800 others between the years 1793 and 1795. 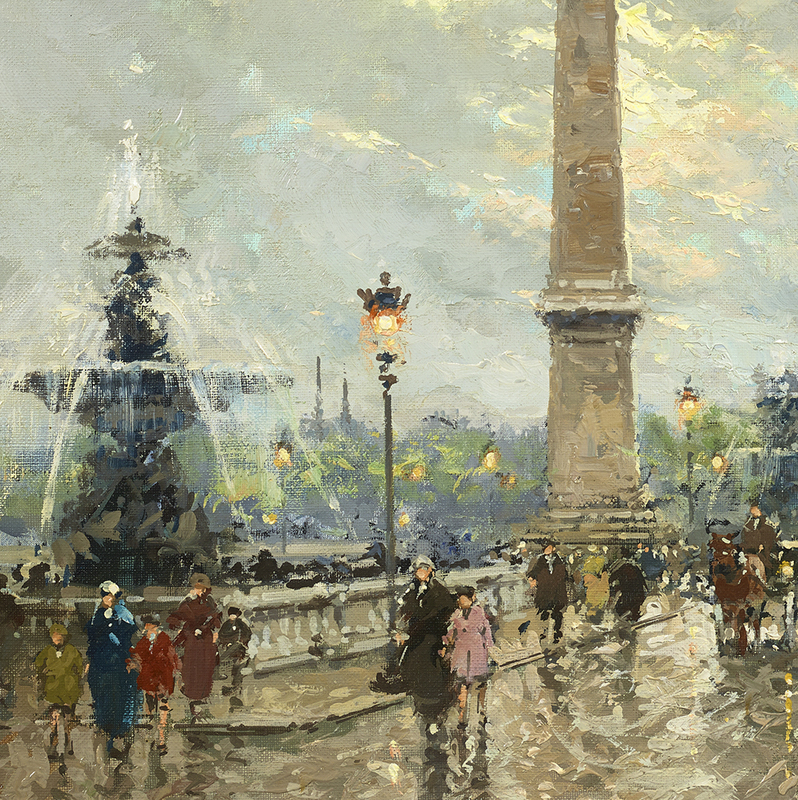 The square went through many name changes: Place de la Concorde, Place Louis XV again, Place Louis XVI, Place de la Chartre and finally back to Place de la Concorde, which symbolized the end of a troubled era and hope for a better future. There are eight statues, one in each corner of the octagon, representing the eight major cities of France: Brest, Rouen, Lille, Strasbourg, Lyon, Marseille, Bordeaux, and Nantes. In the center of the plaza is the Obelisk of Luxor, a pink granite monolith 23 meters (73 ft) high and weighing an amazing 220 tons. It is over 3,300 years old and decorated with hieroglyphics exalting the reign of the Pharaoh Ramses II. The Egyptian viceroy Muhammad Ali Pasha presented the obelisk as a gift to Charles X in 1829 and King Louis Philippe installed it in its current location in 1836. Louis Philippe, bearing in mind the death and destruction witnessed by Place de la Concorde, was pleased to have found a non-political monument to replace the unpopular Louis XV statue. 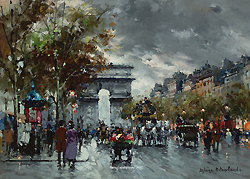 Antoine Blanchard, whose real name was Marcel Masson, was born in France on November 15, 1910 in a small village near the banks of the Loire. He was the eldest of three children and his father, a carver, managed a small carpentry and furniture shop. Antoine would watch his father hand carve the furniture and began to display an artistic flair early in life – in an effort to promote this talent, his parents sent him to Blois for drawing lessons. He continued his training in Rennes at the Ecole des Beaux-Arts where he studied sculpture and drawing. Upon completion of his studies, he was awarded the schools highest award: Le Prix du Ministre. By 1932 he left Rennes and traveled to Paris to study. He enrolled at the Ecole des Beaux-Arts and after a few years entered the competition for the Prix de Rome. It was in Paris that he developed a love for the city and it’s street life. In 1939 Antoine married a young woman he met in Paris and in September of that year war broke out and he was called up for service. It was not until 1942 that he would return to his art. His daughter Nicole was born in 1944 - she too would follow in the family tradition and after the birth of her two daughters, she became an artist working under the name A. Champeau. It was also around this time that Antoine’s father passed away and he was compelled to return to his hometown and run the family business – giving him little time to paint. 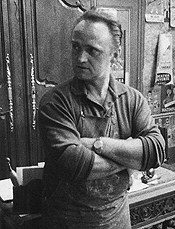 His second daughter, Evelyn, was born in 1947 and by 1948 he had given control of the family business to his younger brother and returned to Paris to paint. Contemporary life in Paris had changed and he longed for the bygone days. He began to research the Belle Époque period in Paris – reading and studying all the material on the period he could find. 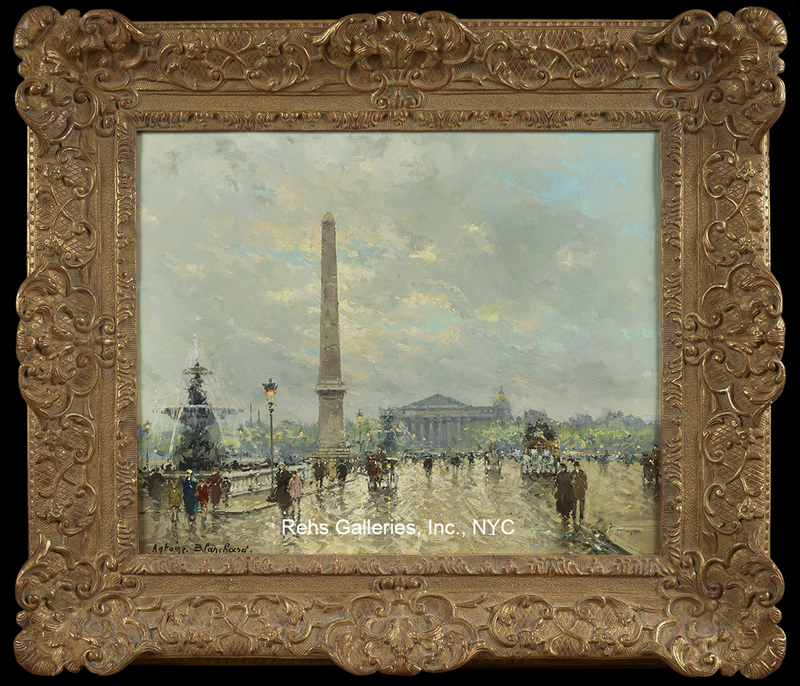 Many of the subjects and scenes he portrayed were taken from images he collected of Paris during the 1890’s and he would often work on paintings for days or months before he finally felt they were complete. 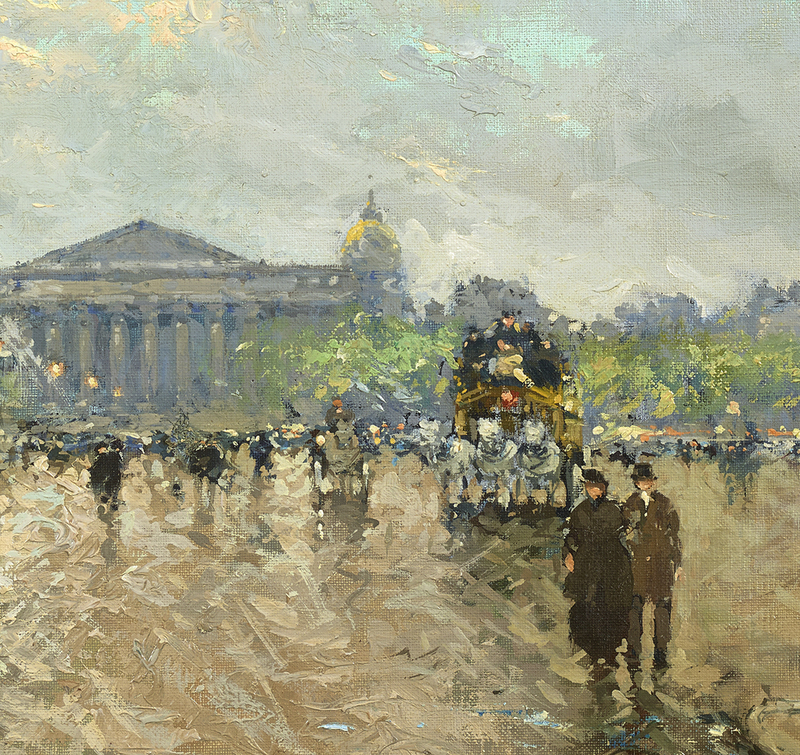 Mrs. Paule Larde comments in her book Antoine Blanchard, His Life His Work that he has always spent much time on his work. This explains why his production has always been rather limited, unlike the hurried and multiple proliferations of some modern artists… Delicate touches of luminous and shimmering tones produce a marvelous impression of harmony, brightness and light. Alternate shadings and lights, sensitive and mellow blending allow the artist to attain a hardly-ever reached degree of grace, of radiant and glimmering freshness. Larde continues to write that his works are first of all, a marvelous invitation to an ideal walk through old Paris, so different from that of to-day. Although a large number of historical monuments remain, today’s Paris has little in common with Paris at the turn of the century; the scenery may be almost the same, but daily life as it characters has totally changed; the customs have been entirely transformed. In his paintings, Antoine Blanchard invites us to relive this period by showing us pleasant strolls along embankments, squares and boulevards at a period in Parisian life when time did not count, when one had all one’s time to idle, to stroll along the streets, to window-shop, to walk quietly along the boulevards or spend the afternoon in a sidewalk café. Édouard Cortès has always expressed himself in a rather rich virile style, using large and stressed touches, revealing a strength, which recalls the great masters of the XVIIIth century. 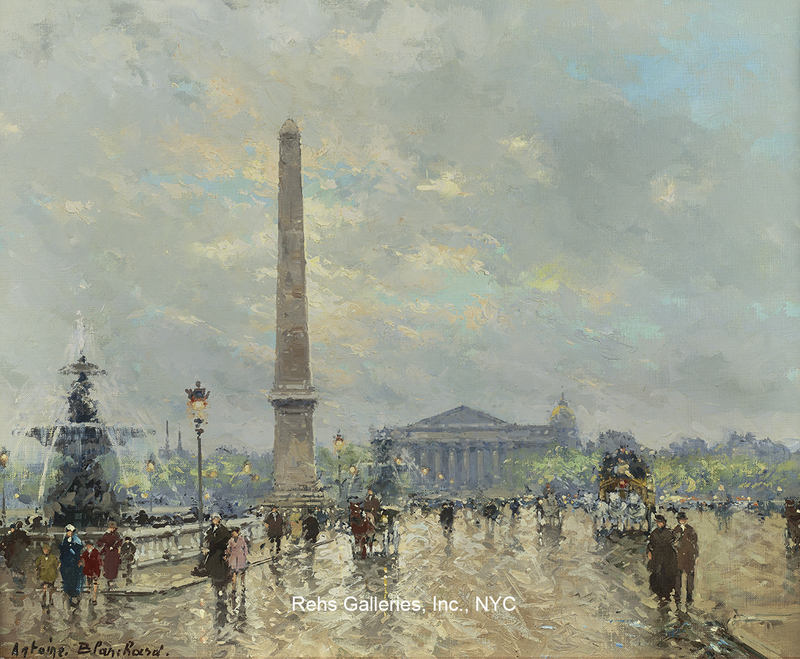 On the contrary, Antoine Blanchard has always used small strokes, with a delicate, enveloping and mellow treatment; the slight haziness which is a characteristic of his work in many ways recalls the great masters of the impressionist period. 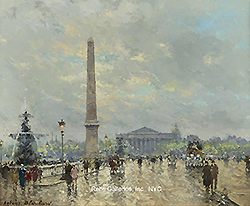 Whether it was l’Arc de Triomphe, la Madeleine, Café de la Paix, Notre Dame or the dozens of other historical monuments and buildings of Paris, his focus was on the daily life of Paris at the turn of the century. His work became highly sought after and collectors from around the world vied to acquire his new works. Today he is considered one of the leading exponents of the School of Paris painters. Blanchard continued to paint until his death on August 10, 1988.